Six seeds depart but did adversaries cause upsets? 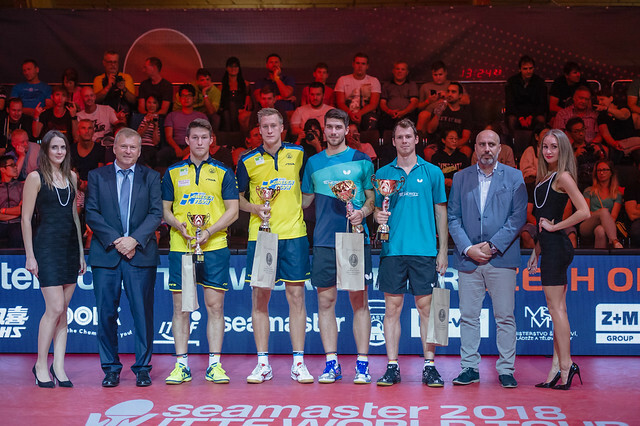 Dimitrij Ovtcharov survived, so did colleague Bastian Steger on what emerged a relatively good afternoon for Germany, as play commenced in the Men’s Singles event at the Seamaster 2018 ITTF World Tour Czech Open in Olomouc in the afternoon of Thursday 23rd August. However, they were the only seeds who survived in the top half of the draw! Most impressively, Dimitrij Ovtcharov, the top seed, beat Japan’s Taku Takakiwa (11-7, 11-8, 11-9, 11-6); Bastian Steger, the no.13 seed, overcame Belgium’s Cédric Nuytinck (11-2, 7-11, 11-2, 11-7, 11-3), whilst Ricardo Walther joined his colleagues in round two by upsetting the order of merit. He accounted for Ruwen Filus, the no.7 seed (11-5, 12-10, 11-6, 8-11, 11-4, 11-9) but the result could hardly been termed and upset, they know each other pretty well; they are compatriots and doubles partners. Three German players through to the second round in the top half of the draw, for a fourth it was defeat, Benedikt Duda, the no.15 seed, was beaten by China’s Zhang Yudong (11-8, 18-15, 11-5, 6-11, 11-8, 7-11, 11-8). An upset but when considering the coaching system from which Zhang Yudong emanates, even though he has minimal international experience was the outcome really a surprise? Equally, when considering the wins recorded by the qualifiers, how many could be termed upsets other than by mathematical seeded calculations? Perhaps, the one result that stood out was the success recorded by Japan’s Mizuki Oikawa; he beat Koki Niwa, the no.3 seed (11-9, 11-7, 5-11, 12-10, 12-10) but then one could argue they are both from the same national association and thus are most familiar with each other. Was it a surprise result? Likewise to what extent was the defeat of Sweden’s Kristian Karlsson, the no.8 seed, by England’s Liam Pitchford (9-11, 11-9, 11-3, 11-8, 11-4) a surprise? Last week Liam Pitchford beat China’s one and only Ma Long! The Englishman is in reasonable form! Similarly, Ukraine’s Kou Lei, the no.12 seed lost to Korea Republic’s Park Ganghyeon (5-11, 11-6, 11-4, 11-7, 11-5), a player who owns three ITTF World Tour Under 21 Men’s Singles titles, whilst for the host nation’s Pavel Sirucek, the no.16 seed, he was beaten by China’s Zheng Peifeng (11-7, 15-13, 9-11, 4-11, 11-6, 11-6). Like Liam Pitchford, last week in Bulgaria; Zheng Peifeng excelled. He beat Dimitrij Ovtcharov before eventually losing at the quarter-final stage to Japan’s Kenta Matsudaira. A surprise, with respect to Pavel Sirucek I suggest Zheng Peifeng was the favourite. The lower half of the draw will be conducted later in the day.